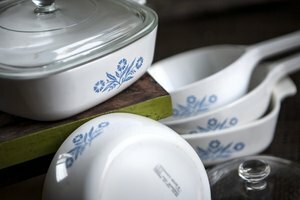 Broiler pans are subjected to high heat that bakes on stubborn grease and food residue. Clean them thoroughly after every use to prevent stubborn stains. 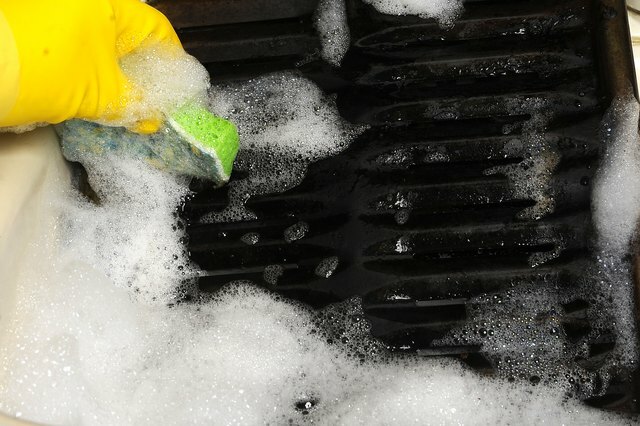 The right cleaning techniques let you do so while keeping the scrubbing to a minimum. 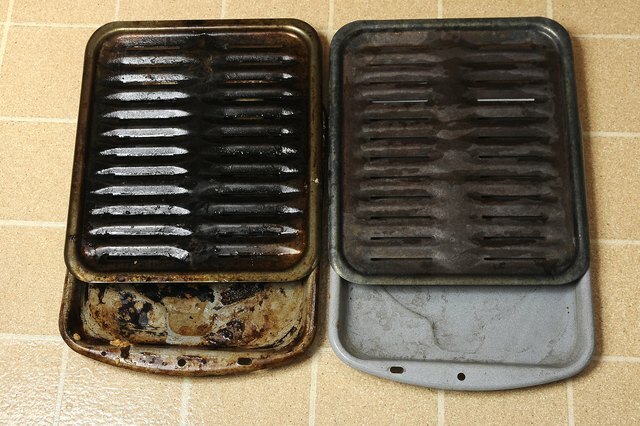 A heavy soaking may be all your broiler pan needs to look clean again. Fill the sink with hot, soapy water and add a cap-full or two of ammonia. Don't mix bleach or other cleaners with ammonia, because this will produce a harmful gas. If your sink isn't big enough to fully submerge your broiler pan, use a large plastic tub or even the bathtub. Soak the broiler for 30 minutes or longer until the cooked on food comes off easily with light scrubbing. Avoid heavy scrubbing with an abrasive brush or cleaner, which can damage the finish on the broiler pans. 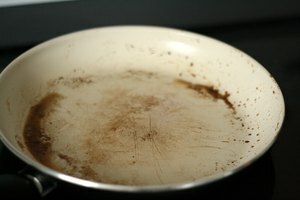 If your broiler pan is especially greasy or covered in stubborn baked-on food, skip the ammonia. Instead, heat the broiler pan in the oven until it's too hot to touch with bare hands. 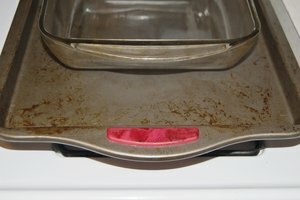 Turn off the oven and remove the pan, setting it over the sink to catch any drips during cleaning. Mix 1 cup apple cider vinegar with 2 tablespoons of sugar, and smear it over the top of the broiler. After an hour, wipe off the grease with a wet sponge and light scrubbing. A second treatment may be necessary for especially stubborn grease and stains. 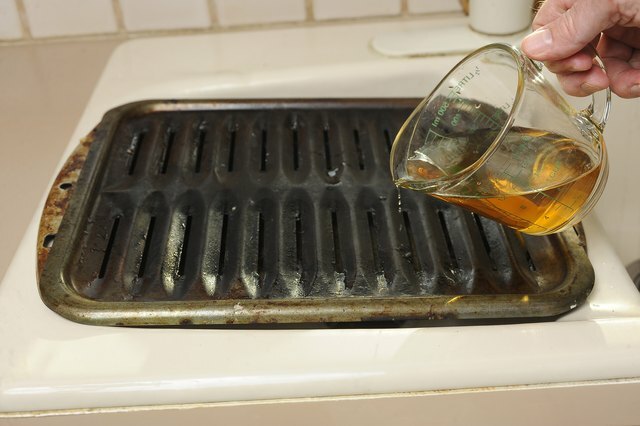 Although soaking and vinegar treatments can remove most of the baked-on grease, some scrubbing is usually necessary. 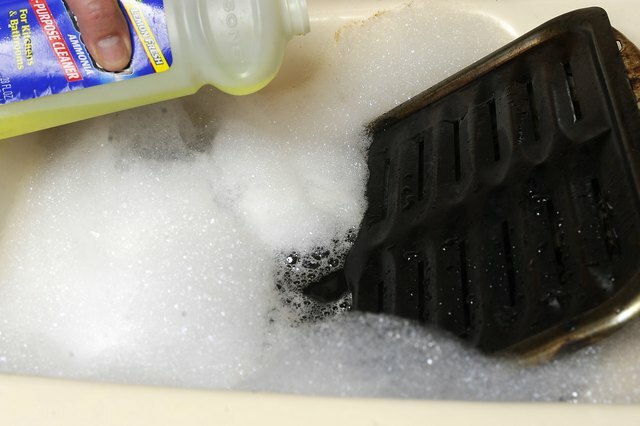 After removing most of the mess, wash the broiler pan in a sink full of hot, soapy water. Avoid heavily abrasive cleaners and steel wool, which may damage the surface. Use only a mildly abrasive sponge or plastic scraper to remove remaining debris. After scrubbing, rinse the pan thoroughly in clear water and dry it before storing it. Some self-cleaning ovens allow you to clean the broiler right along with the oven. Check the oven's operating manual to ensure that this is a safe option. If your broiler isn't the one that came with the oven, you must also check with the manufacturer of the pan that it's safe for a self-cleaning oven. Wash as much grease from the broiler pan as possible to avoid oven fires during cleaning, Set the broiler pan in the oven, lock the oven door and set the self-cleaning cycle following manufacturer's instructions. 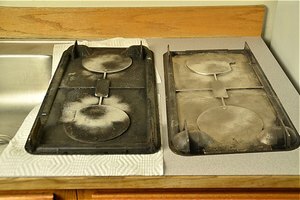 After cleaning, allow the oven and the pan to cool completely before removing it. 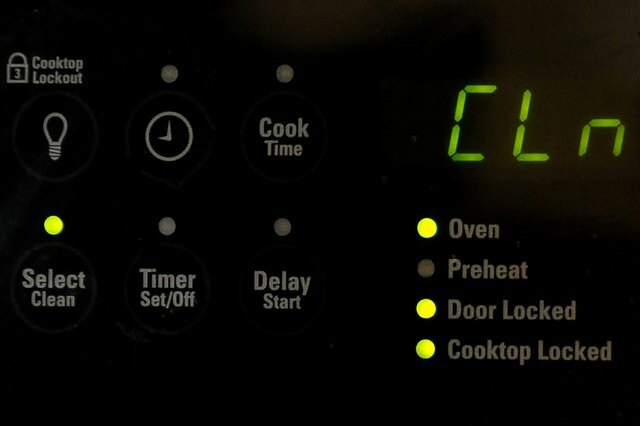 Most ovens unlock after the oven cools sufficiently.